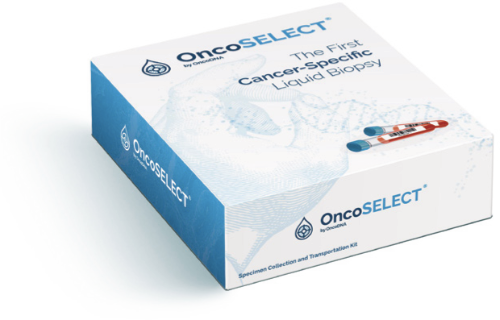 Is OncoSELECT the right test right for you? This fast, minimally invasive blood test is about helping you and your clinician establish the best treatment plan for you. It looks for the presence of specific biomarkers that can identify how your cancer is likely to respond to classic chemotherapies as well as other targeted therapies and immunotherapies. It is also looking for variants associated with any resistance to classic treatments – or whether new treatment options could be indicated. There are several reasons why it is not always possible to test a sample of actual tumour tissue – it may be that that it that is challenging or simply not possible to perform a biopsy of the primary tumour or of any metastases, or it may be that existing biopsy samples are too old. However, testing your blood can still give you and your clinician valuable insights into the best therapies and treatments for your particular cancer. OncoSELECT can also be used as a monitoring tool: the analysis is more sensitive than routine imaging – it shows how a tumour is responding to treatment and detects potential resistance. This means your treatment can be adapted, and, by doing so, could improve survival rates. This test requires two blood samples. These may be available from samples taken during your cancer diagnosis, and if so, you will not need an additional medical procedure to take this test. Your clinician will be able to advise you about this. This test is only available through your clinician, who will receive your test results directly. Step 1: Buy the test. You will receive an email asking you to confirm that you have authorised ELG to be given a sample of your blood. We will contact your pathologist directly and organise the collection of your samples and delivery to the lab. Your samples will be analysed and a report will be generated, usually within 10 working days of their receipt in the laboratory. We analyse more than 100 resistance mutations and sensitivity to targeted therapies as well as specific genes selected for each cancer type. Your clinician will receive a comprehensive report covering all of these elements together with details of specific therapies relevant to you. We also offer OncoTRACE – a follow-up test which can make a comparison with previous analyses to show how your individual cancer is responding to treatments. Click here to find out more. OncoDNA’s innovative approach is to combine next-generation sequencing (NGS) with immunohistochemistry (IHC). This gives a comprehensive view of a tumour profile, at both DNA and protein levels and opens more therapeutic options for your patient. In 2016, liquid biopsy analyses were added to its solution portfolio, either in combination with solid biopsy analysis or as a stand-alone analysis for diagnostic or monitoring purposes.